The San Diego Padres were one of the big winners of the offseason after signing free agent Manny Machado. However, it remains to be seen how much the addition of Machado will help advance the team’s rebuilding project. 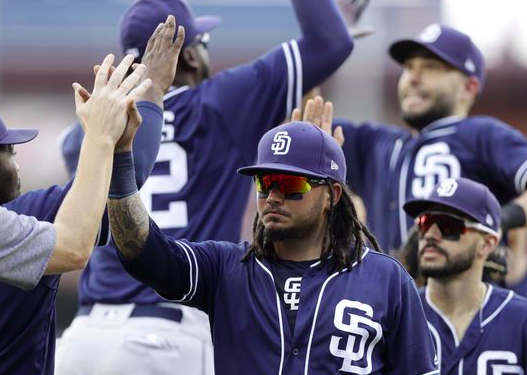 Can the Padres become surprise contenders in 2019 or is San Diego still a year or two away from working their way up the NL West pecking order? San Diego’s rotation is perhaps the biggest reason why they may not be ready to compete this season. The Padres are still in the process of bringing their young starters along to the point where they are ready to lead a contending team. Both Joey Lucchesi and Eric Lauer have started to establish themselves as solid mid-rotation options. Both made over 20 starts last year and registered ERAs of 4.08 and 4.34, respectively. However, neither is a frontline starter, at least not yet. There’s a chance Garrett Richards joins the rotation for the second half, but with his injury history, that’s far from a guarantee. Meanwhile, the likes of Robbin Erlin, Matt Strahm, Jacob Nix, and Bryan Mitchell will all have a chance to earn full-time rotation spots. Mitchell should be a solid if unspectacular option at the back end of the rotation, but both Erlin and Nix got knocked around last year. Strahm was impressive last year but more so in a relief role. On the bright side, the Padres have seven pitchers who are ranked among the top 100 prospects in baseball. The down side is that only a few will pitch in the majors this year and most won’t make a significant impact for at least a couple of more years. Surprisingly, the San Diego bullpen was one of the best in the National League last season. They no longer have the services of Brand Hand and Adam Cimber, who were both traded to Cleveland last summer, but they still have a strong contingent of bullpen arms. Veterans Kirby Yates and Craig Stammen led the way last year, and the Padres hope they can continue to hold down the fort in 2019. San Diego also added Adam Warren to give them a third veteran pitching at the back end of their bullpen. Of course, the rest is all up to the team’s contingent of young pitchers. As mentioned, Strahm could be a force in the bullpen if he’s not used in the rotation. Aaron Loup was also added over the winter as a veteran lefty coming out of the bullpen. Beyond that, it’ll be up to guys like Phil Maton, Robert Stock, and Luis Perdomo to prove their worth. Maton was a competent middle reliever last year while Stock impressed in his 32 appearances. Perdomo could be the wild card of the group. He has struggled to establish himself as a starter, but his stuff could translate well to a bullpen role. The Padres scored the third-fewest runs in baseball in 2018, so it’ll take more than Machado to get things turned around. That being said, there is hope that the San Diego lineup will be a lot more formidable in 2019. Machado will have Eric Hosmer and Wil Myers hitting alongside him. Both had disappointing seasons in 2018, but if they can have bounce-back seasons with opposing pitchers worried about Machado, the Padres will have a nice trio in the middle of their order. Second baseman Ian Kinsler will also give San Diego another veteran bat, even if he’s well past his prime. From there, it’ll be up to the team’s young players. Right fielder Hunter Renfroe has put together back-to-back seasons with 26 home runs, making him a legitimate threat down in the order. The Padres also have a contingent of young outfielders with high upside, including Manuel Margot, Travis Jankowski, and Franchy Cordero. Margot is key because he has tremendous upside as a two-way player, but the Padres at least have other options if he can’t get it going offensively. Finally, the Padres have a couple of more x-factors in shortstop Luis Urias and catcher Austin Hedges. Urias is just 21 but is talented enough to be a .300 hitter and above-average defender. The Padres hope he can establish himself while they wait on top prospect Fernando Tatis Jr., an elite prospect who could appear in the big leagues the second half of the season. Hedges, meanwhile, made some progress last year but still hasn’t become a consistent offensive force. It may be now or never for him with catching prospect Francisco Mejia knocking on the door to the big leagues. Between the signing of Machado and all of the young talent, the Padres will be fascinating to watch in 2019. However, an improved offense and a solid bullpen probably won’t be enough to make up for a rotation that is bound to have some issues. Until all of their young pitching prospects are ready to contribute, the Padres won’t be ready to compete. After finishing 66-96 last year, look for the Padres to finish 76-86 in 2019, a 10-win improvement that will set the stage for a potential leap in 2020.